Picturing Disney: Part 3 2007: Meet, Greet, & Eat at Epcot! By the time we woke up on Monday morning we were feeling great. Happy. Refreshed. Excited. Magical. Well, after having our first day turned out so fabulous we had decided not to set any alarms and just sleep until we woke up. I rolled over and saw that the clock read only 8:30 and quickly calculated that it meant I have gotten much less than a full nights sleep so I just laid in bed thinking about the day in Epcot that was ahead of us. Rob finally woke up at about ten after 9 and we began to get ready for the day. After Rob had his adult breakfast platter and I snacked a fruit cup and water bottle we headed to the bus stop and caught a fairly quick arriving bus to Epcot. We entered by around 10:30am and after stopping for some Photopass pictures. We headed over to FastPass Soarin’. Why does that golfball always amaze me? It looks almost cartoonish to me. We decided to stay at The Land and do a couple of other attractions. We started with Living with the Land, which we both thought was way cool. Loved the Mickey shaped fruits, the Tomato trees, and all the other interesting things they are working on in there! The Circle of Life had just started so we decided since it looked like we had until after lunch to return for our FastPasses we would do Circle of Life after Soarin’ and then headed towards the Seas. We got right in the quick-moving line for The Seas with Nemo and Friends and that ride was adorable! I loved the Clam-mobiles! Plus it dumps you right out in the Seas and after waving to a diver doing a demonstration we experienced Turtle Talk with Crush for the first time! Sooooo adorable! Duuuuuuuude! Since I had checked the Times Guide and saw that both Belle AND Aladdin would be making appearances at 12:30 we then headed over to France and Morocco in search of our childhood friends! Finally a nice man in a fez told me I could find Aladdin AND JASMINE in the back of a store. So we headed over… not there! We took some pictures and wandered around Morocco some more, when we decided to head back out to the area between Morocco and France because a shopkeeper had told us that both sets of characters sometimes wait out there! Low and behold we spotted Belle right away! We were the 3rd people in line and I got to have a very nice conversation with her about our princes! While waiting to meet Belle we had noticed the Aladdin and Jasmine line not 50 yards away so we went right from meeting Belle to their line. We were luck enough to be the second to last people in a line of around 6 or 7. The family behind us was nice enough to take this picture for us. 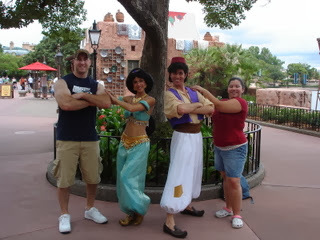 Afterwards, Jasmine asked Rob “So where are you guys from?” to which Rob said “New York.” Then Jasmine turns to Aladdin and says “Ohhh… didn’t you and Abu go there once, looking for the Big Apple?” and Aladdin shook his head and said, “Yea… but we didn’t find it!” HAHA! I got such a kick out of that! So cute! As we were walking away I heard the father from the family behind us ask them “So you are from Morocco?” and Aladdin said, “No, actually we are from Agrabah- its north of here, just east of the river Jordan.” They were such great characters! In any case, after all that meet and greet we were starving and it was around 1:15 and just couldn’t resist Mexico. It is our favorite Pavilion and we got lunch at Cantina de San Angel. On our way we grabbed some margaritas. It’s 5 o’clock somewhere, right? Just outside where we were sitting the Viva Mexico band was playing with a dancer. It was a great little lunch show for the two of us! We had a great view. After we finished watching and eating we headed into the pavilion to ride Gran Fiesta Tour starring the 3 Caballeros for the first of 3 times during our vacation! I LOVE LOVE LOVE this ride! Our family had the most fun at Epcot! I cannot wait to go back in 2013!! It really cant be matched! Wish we were there right now!